There is a growing body of research that supports what we all know intuitively—design matters. Students are affected by their learning spaces. Despite the scientific evidence, budgets are tight, and atmosphere or environment doesn’t always hold the highest priority. Fortunately, there’s a lot that can be done on a small budget for big impact. 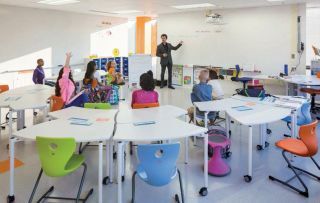 We talked with Megan Fagge of Cooper Carry about her top ten tips to create an ideal and inspirational learning space.